Colonial Revival. 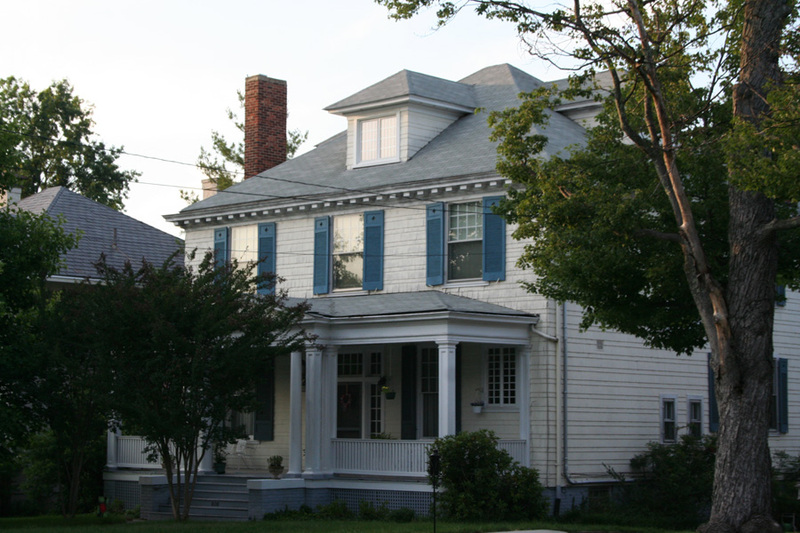 2 1/2-story, 3-bay frame house with unusual siding, 1-story porch and 2-story rear wing. Windows have 12/1 sash. 1909-1936 Unknown 1936-1955 George E. & Grace A. Chamberlin 1955-1964 A. E. & Frances S. Stump 1964-1978 Arthur E. Stump Jr. 1978-1997 E. Dwayne & Sandra R. Perry 1997-1998 Sandra R. Reynolds 1998-2000 Mark R. & Martha E. Hibbard 2000-2001 Thomas R. Kent Jr. 2001-Present Elizabeth Johnson & Thomas R. Kent Jr.
Interview with Beth Kent on June 10, 2010: Beth Kent bought her home on RIvermont Avenue in 2000. The house was built in 1909, and it is rumored that a past owner, Mr. Chamberlain, in order to avoid banks, put his cash in the walls.